This past Saturday on the 16th, I completed the Boomer’s Cystic Fibrosis Run to Breathe (4M) 2016 Brought to You by Vertex. This race was in collaboration with Team Boomer and Vertex as supporters for people living with and fighting cystic fibrosis, a genetic, life-threatening disorder that affects the lungs, pancreas, liver, kidneys and intestines. 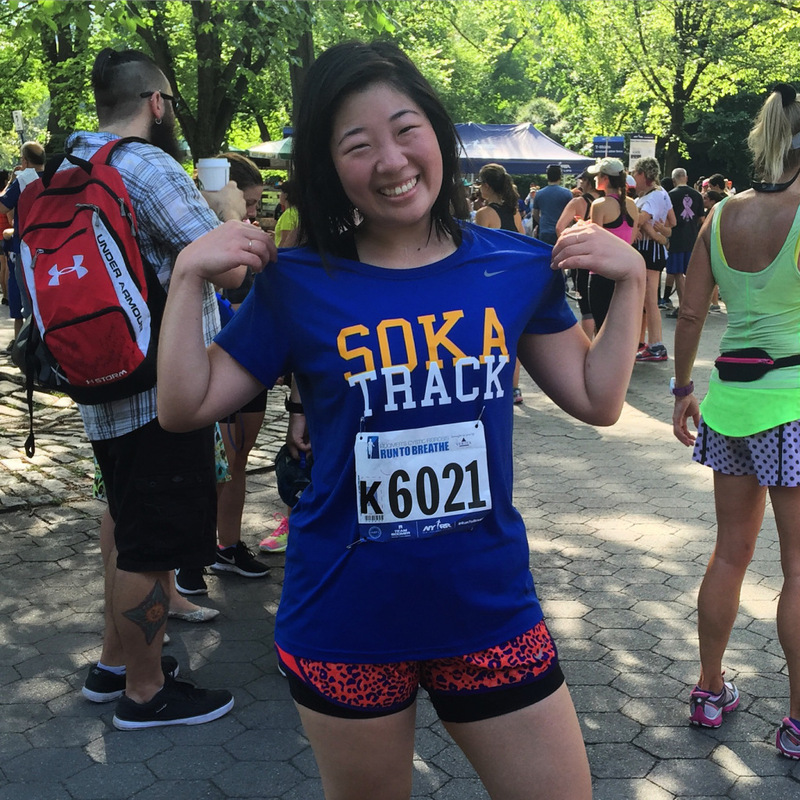 Running side-by-side with athletes affected by this condition and supportive New Yorkers was a huge honor and I’m proud to be a finisher who made it through the excruciating summer heat. To keep my tradition rolling, I’m sharing five thoughts and reflections from race day. three out of nine, complete! Here is the most embarrassing life confession: I have been wearing the wrong shoe size for a decade. What has my life come to? I recently went to Asics because a teammate works there and I wanted to figure out why my shoes kept giving me blisters. It was also time to replace my old, beat-up shoes. I really wanted bright and tacky shoes to complement my jaguar shorts (pictured below). After trying on a few pairs, we discovered that I was wearing shoes that were an entire size too big. I am ashamed and wondered how I have gotten away with it without serious injuries. However, now that my shoes are sized properly, I can focus on racing like a true champion. I got a PR! Well, my results for every race has been a PR (personal record) but this one feels especially good. I made a concrete goal to break 40 minutes and I did. Last month, I ran the Retro 4-Miler in 40:30 and this past weekend, I ran the same distance in 39:29. It was a tough race because it was disgustingly hot and humid. We were cautioned to go easy and not break world records but I still managed to get a personal record. I also loved that it wasn’t even 9:00am yet when I crossed the finish line. When the rest of the world is still asleep and recovering from the work week, I have already obliterated four miles. It feels badass to have the privilege to say that. This race made me realize that I need to be embodying the notion of pursuing the impossible so I can truly succeed in consistently breaking my personal records and being fit enough to run the marathon next year. The remarkable thing about the human body and life in general is that we believe our potential is much lower than it actually is. Running reminds me that I’m capable of so much more and that I need to obliterate all limitations I place on myself. Rather than think about whether running is doable or not, I’m heading straight to what seems impossible: the Marathon. I will run it, just watch. When I was on an excursion to the Amazon Jungle seven years ago on my semester study abroad in Quito, Ecuador, I didn’t drink any water during a three-hour hike and suffered a massive heat stroke that left me bedridden and mentally scarred. I never want to experience that again. I avoid drinking so much water because I hate the process of going to the toilet every ten minutes. However, I remember this incident and am reminded as to why I need to take care of myself and constantly hydrate. Running in the middle of summer is great but can also be dangerous. When I crossed the finish line, I made sure I grabbed five cups of water to replenish. Running may be a solo sport but it can’t happen without collaborative efforts from the community. During college, my team was everything from the morning wake-up calls to the motivation I needed to continue. Now, as an active racer, I’m seeing NYRR collaborate with various organizations to support causes, such as fighting cystic fibrosis, and bringing together people from all walks of life to one place. These races can’t happen without dedicated volunteers, medical professionals, local organizations, donors and everyone else in between. I have nothing but sincere appreciation for each and every person that makes running possible. these jaguar shorts help me run faster. Here’s to my third complete race with six left to go. Progressing on this 9+1 journey feels amazing. This past week, I had about five people come up to me and say that they want to start running again too. It’s an honor to hear that my running is inspiring others to do the same. In fact, I even convinced a coworker to get NYRR membership and join me on this brutally hot day to race and finish four miles before most people woke up to start their weekend. 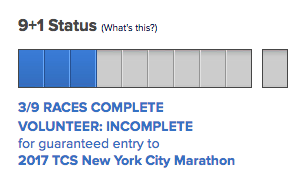 My next scheduled race is the NYRR R-U-N 5K race, which I am thrilled about. I haven’t ran a real 5K since fall semester my my senior year in college so this is one that I am looking forward to. It’ll be on Thursday evening so if you’re around, come by and cheer. If you’re really daring, run with me.